Around there globe, there are many amazing bridges that combine interesting history, incredible architecture and breathtaking views. Crossing a great bridge, especially on foot, can be quite a memorable experience, not to mention it’s completely free. While it is hard to choose only ten, here is a list of some of the best bridge walks around the world that everyone should experience. The historic Charles Bridge crosses the Vltava River and is about 1,700 feet long. Its construction began in 1357 under the sponsorship of King Charles IV. Today, the bridge is a lively attraction, with artists, entertainers, and marketers catering to tourists during the day. In the evening, the setting is a bit more peaceful and the bridge and Prague Castle are lit up, giving the structure an entirely different vibe. During both times, you will get great views of the city and its sites. One of the oldest suspension bridges in the United States, the Brooklyn Bridge connects Manhattan to Brooklyn and goes over the East River, giving walkers spectacular views of the New York City skyline. The main span of the structure is about 1,600 feet and is not only an icon of New York but also a National Historic Landmark. The bridge has been used during many situations by New Yorker’s to leave Manhattan on foot, such as during the blackouts of 1965, 1977, and 2003, as well as after the infamous 9/11 attacks on the World Trade Center. The Henderson Waves Bridge is an 899-foot long pedestrian bridge that connects Mount Faber Park with Telok Blangah Hill Park. It is the highest pedestrian bridge in Singapore, sitting 118 feet above Henderson Road. What makes this bridge so special is it’s unique curved design, making it look similar to a roller coaster, with hidden alcoves and seats inside. Make sure to experience this bridge at night in between 7PM and 2AM when the LED lights are on. The Ponte Vecchio is a Medieval arch bridge that spans the Arno River. It’s most famous for still having shops on it, as was once very common. Stroll across the bridge while perusing the goods of artisans, jewelers, and souvenir sellers while taking photos of Renaissance architecture. The bridge also has a bit of an ironic history. After being destroyed by floods and being rebuilt multiple times, it is the only bridge in Florence not destroyed during WWII. The Jacques Cartier Bridge is a steel truss bridge that gives people access to Montreal Island, St. Helen’s Island, and Longueuil. It spans the Saint Lawrence River and walking over it will give you spectacular views of Montreal, especially at night. In the summer the bridge closes to vehicular traffic for the annual fireworks competition held at La Ronde, with the Jacques Cartier being the best viewing spot for the show, sometimes drawing more than 50,000 people. The Golden Gate Bridge in a suspension bridge that spans the opening of the San Francisco Bay into the Pacific Ocean (also known as the Golden Gate) and connects San Francisco to Marin County. 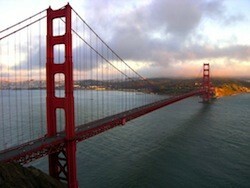 It has been declared one of the modern Wonders of the World by the American Society of Civil Engineers and has been said to be “possibly the most beautiful, certainly the most photographed, bridge in the world” by Frommer’s travel guide. While the stroll across the Tower Bridge is short, the views make this a must-experience. Often mistakenly referred to as the London Bridge, the structure holds two towers that are connected by two horizontal walkways. For a bit of an adventurous experience, go inside the towers to explore the exhibits of film, photos, and interactive displays. Then, walk across via the upper walkway for photo-worthy views of the Thames River and London’s famous sites. Of course, a bridge that gives views of the Eiffel Tower and the Chaillot Palace would have to be included in this list. The Pont D’iéna spans the Seine River and connects the Left Bank, where the Eiffel Tower is, to the district of Trocadéro on the Right Bank. Where the bridge begins on the Left Bank you will get the feeling that you are at a small fair, with the festive atmosphere and carousel ride. As you walk along, you can also see sculptures of warriors that were put there in 1853. The Magdeburg Water Bridge is a navigable aquaduct connecting Elbe-Havel Canal to the Mittellandkanal. This unique bridge crosses the Elbe River and, at 3,012 feet, is the longest navigable aquaduct in the world. Basically, this bridge is a raised body of water that sits over another body of water, which can be a pretty interesting sight (as you can see in the photo on the right from Wikipedia). 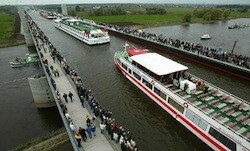 Snap pictures of the German countryside while watching the ships as they pass by.